Level-5 will be bringing their popular IP Professor Layton to a TV anime series in summer 2018. According to the September issue of Total Licensing Magazine, the 26-episode “animated product” is part of a planned franchise expansion of a “variety of content” by Level-5 and its overseas localization affiliate Level-5 abby. The two will be in attendance at the upcoming Brand Licensing Europe and MIPCOM trade show in Europe this October, where presumably Professor Layton will be a major focus. The magazine also confirmed a new Layton title is due next summer, but whether it’s an actual game was not specified. 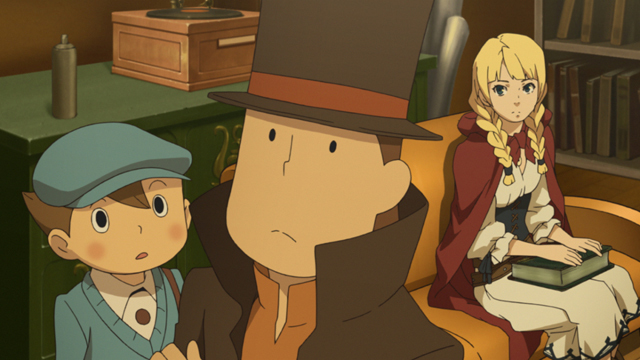 The upcoming TV anime is not the first time Layton has appeared in long-form narrative animation. He and his ward Luke starred in the 2009 movie, Professor Layton and the Eternal Diva, which was licensed to the US through Viz Media. It’s not hard to imagine the push for Layton to appear in anime, as the Layton franchise remains one of Level-5’s most successful franchises a decade on, pushing 15.5 million units worldwide as of April 2015. The latest franchise game Layton’s Mystery Journey: Katrielle and the Millionaires’ Conspiracy launches in the US on 3DS this Friday.